Arizona Prison Watch: Martori Farms and the AZ Department of Corrections. Martori Farms and the AZ Department of Corrections. It's come to my attention that the women from ASPC-Perryville who are providing the prison labor to Martori Farms are being coerced into taking the jobs by the guards responsible for recruiting them, and are reportedly working at times without water, sunscreen, adequate nutrition and full breaks, and without regard to medical concerns or age. Those who refuse the jobs or don't work sufficiently hard enough in the fields - or who even just complain - are threatened with being written up (a major ticket which can cost good time), or thrown into the hole. The women are afraid for their health and safety; some are allergic to the bees they are harvesting, and others have been told to work through serious symptoms such as chest pain, still being dismissed as malingering - reminiscent of what happened to Brenda Todd and Susan Lopez, when they begged for medical care. They're presently working 8-hr days/6 days a week (not including the 1+ hour trek to and from the farm). Come harvest time, they've been told they'll be working 12-hour days. Upon receiving this information, I called OSHA - the Department of Labor doesn't have jurisdiction over prison labor, even when contracted to private farms. The only department in the state, outside of Arizona Department of Corrections (ADC) they referred me to was the AZ Department of Administration's Risk Management people - they're the only ones who care about prisoner-worker "rights", it appears, because they want to minimize liability (which has little to do with taking responsibility in practice, it appears). The Department of Administration referred me back to the ADC, to a guy by the name of Barry Keith. I told them I already contacted the ADC"s general counsel's office about the issue, and want outside eyes on the prison to assure worker's rights are being protected. They had no one else to refer me to, though, so I left a message for Mr. Keith. We'll see who gets back to me with what - I'm not on the best of terms with them these days. Again, I'm urging people to contact the Chair of the AZ House Health and Human Services Committee, Rep. Cecil Ash, and request hearings on the conditions in the prisons. cc me (see margins), the Phoenix New Times (PO Box 2510, Phoenix, AZ 85002 / Phone: 602-271-0040 / Fax: 602-340-8806) and your own legislators on your concerns, please...let me know if I can print what you write. Picacho, Ariz. -- Near this dusty town in southeastern Arizona, Manuel Reyna pitches watermelons into the back of a trailer hitched to a tractor. His father was a migrant farm worker, but growing up, Mr. Reyna never saw himself following his father's footsteps. Now, as an inmate at the Picacho Prison Unit here, Reyna works under the blazing desert sun alongside Mexican farmers the way his father did. "My dad tried to keep me out of trouble," he says, wearing a bandanna to keep the sweat out of his eyes. "But I always got back into the easy money, because it was faster and a lot more money." He's serving a 6-1/2 year sentence for possession and sale of rock cocaine. As states increasingly crack down on hiring undocumented workers, western farmers are looking at inmates to harvest their fields. Colorado started sending female inmates to harvest onions, corn, and melons this summer. Iowa is considering a similar program. In Arizona, inmates have been working for private agriculture businesses for almost 20 years. But with legislation signed this summer that would fine employers for knowingly hiring undocumented workers, more farmers are turning to the Arizona Department of Corrections (ADC) for help. "We are contacted almost daily by different companies needing labor," says Bruce Farely, manager of the business development unit of Arizona Correctional Industries (ACI). ACI is a state labor program that holds contracts with government and private companies. "Maybe it was labor that was undocumented before, and they don't want to take the risk anymore because of possible consequences, so they are looking to inmate labor as a possible alternative." Reyna and about 20 other low-risk, nonviolent offenders work at LBJ Farm, a family-owned watermelon farm, as part of ADC's mission to employ every inmate, either behind prison walls or in outside companies. The idea is to help inmates develop job skills and save money for their release. "It helps them really pay their debt back to the folks who have been harmed in society, as well as make adequate preparation for their release back onto the streets." says ADC director Dora Schriro. If it weren't for a steady flow of inmates year-round, says Jack Dixon, owner of LBJ, one of the largest watermelon farms in the western US, he'd have sold out long ago. Even so, last year 400 acres of his watermelons rotted on the ground - a $640,000 loss - because there weren't enough harvesters. Mr. Dixon had applied for 60 H2-A guest worker visas, but only 14 were approved because of previous visa violations. "We are in desperate need for hand labor," says Dixon, who started working on the farm when he was 9, alongside mostly migrant workers. "It's hard to get migrant workers up here anymore, with all the laws preventing them. It's not what it used to be," Dixon says. "It's dangerous for them with all the coyote wars and smuggling." Other farmers wonder if inmates could be their solution. Dixon has received calls from a yellow-squash farmer in Texas inquiring about how to set up an inmate labor contract as well as from another watermelon farmer in Colorado seeking advice on how to manage inmate crews. For labor-rights activists, federal immigration reform is the only viable solution to worker shortages. Marc Grossman, spokesman for the United Farm Workers of America, says inmate labor undermines what unionized farmworkers have wanted for years: to be paid based on skill and experience. "It's rather insulting that the state [Arizona] would look so poorly on farm workers that they would attempt to use inmates," Grossman says. There is also the food-safety aspect, he says: Experienced workers understand sanitary harvesting. "Agriculture does not have a reliable workforce, and the answer does not lie with prison labor," says Paul Simonds of the Western Growers Association, a trade association representing California and Arizona. "This just underscores the need for legislation to be passed to provide a legal, stable workforce." A prison lockdown would be disastrous, he points out, with perishable crops awaiting harvest. Other crops, like asparagus and broccoli, require skilled workers. Although the ADC is considering innovative solutions - including satellite prisons - to fulfill companies' requests for inmate labor, prison officials agree that, in the end, the demand is too high. "To go into a state where agriculture is worth $9.2 billion and expect to meet a workforce need is impossible," says Katie Decker, spokeswoman for ADC. At any given time only about 3,300 prisoners statewide (out of a prison population of about 37,000) are cleared to work outside. ACI provides inmates to nine private agricultural companies in Arizona, ranging from a hydroponics greenhouse tomato plant to a green chile cannery. Unlike other sectors where federal regulations require that inmate workers be paid a prevailing wage and receive worker compensation, agricultural companies can hire state inmates on a contract basis. They must be paid a minimum of $2 per hour. Thirty percent of their wages go to room and board in prison. The rest goes to court-ordered restitution for victims, any child support, and a mandatory savings account. Private companies are required to pay for transportation from the prison to the worksite and for prison guards. For Reyna, his work on farms over the past couple of years has added $9,000 in his savings account and given him a renewed respect for his Mexican father's lifetime of stoop labor. At Dixon's farm, it's 103 degrees F. The inmate crews, wearing orange jumpsuits, work in a rhythmic line, calling out the number of the watermelons, and alongside the trailer. Just a few yards away, Mexican workers also work in a line. The inmates will quit at 4 p.m., while the immigrant laborers may work 13-hour days. "We go back, they stay out here," Reyna says. "It really isn't the same." In the farm's office, watermelons line the counter, and photos of migrant workers hang in dusty frames. When asked why he doesn't sell the farm, Dixon says, "the inmates, the migrants, these people are part of the family - that's why I keep this darn place." Dixon says he supports the idea of a reformed, guest-worker program that would employ migrant workers during the harvest and return them to Mexico in the winter. But until that happens, he's willing to fight for the workers he's shared the land with for most of his life. "People are crossing the border because they are starving to death," Dixon says, "I don't care what their status is. If they are hungry and thirsty, I am going to feed them." "I could sell this and quit," he continues, "But I believe in supporting the American farming industry." © 2011 Christian Science Monitor All rights reserved. individuals, corporations, organizations and investment companies that support the use of prison labor or enable prison industry operations by contributing financial support to those directly involved in using inmates for labor or invest in or support private prison corporations. To demonstrate how difficult involvement in prison industries and the use of inmate labor is to identify, we'll begin with an investment firm involved in many of our 401(k) and retirement accounts. Fidelity Investments (Fidelity). This "financial investment" corporation is involved in holding the retirement and 401(k) accounts of millions of Americans. Many of the largest companies in our country offer Fidelity Investments as the sole source of retirement investing for their employees. Fidelity was previously identified as a funder of the American Legislative Exchange Council (ALEC) in an earlir Insourcing blog. ALEC is deeply invested in supporting Corrections Corporation of American (CCA) and Geo Group (Geo) - that are both corporate members of ALEC. ALEC has willingly accepted responsibility for enactment of laws authorizing and increasing the use of inmates in manufacturing of products as well as the housing of those inmates by private corporations such as CCA and Geo. I purposely mentioned McDonald's in the intro because though they are not "directly" using inmate labor in their food service operations, they are dependent upon the use of inmate labor to reduce costs associated with those operations. The way they do this is by contracting to purchase their uniforms and some of the plastic utensils provided to customers from a company using inmate labor to make those uniforms and utensils. The uniforms are made by Oregon Inmates. Wendy's has also been identified as relying upon prison labor to reduce their cost of operations - and they fund ALEC. Two other U.S. companies relying upon prison labor for products sold in their stores are K-Mart and J.C. Penny. Both sell Jeans made by inmates in Tennessee prisons. The same prison in Tennessee provides labor for Eddie Bauer's wooden rocking horses. There are other products we would not associate with prison made products: dentures, partials, eye glasses, processed foods such as beef, chicken and pork patties sold to and served in our schools, grocery stores and hospitals. I don't know about you but putting dentures made in prison in my mouth just somehow causes me concern...just as buying a box of breaded chicken patties and fixing them for my family does. As the foregoing illustrates, many U.S. companies and corporations not only fund ALEC's activities regarding prison labor and PIC, they have foundations that also contribute handsomely to ALEC. Many are represented upon ALEC"s Private Enterprise Board. Commodities, services and various products sold to U.S. consumers provide profits to these companies/corporations that are used to further the goals of ALEC. They sell us our vehicles, Chrysler, Ford, GM...sell us the fuel to power those vehicles, insurance to cover our cars and trucks. Some of our homes are mortgaged through banks and mortgage companies affiliated with ALEC. Our homes are insured by carriers supporting the use of inmate labor. Our phones are provided by those who are also involved and our medications also fund these same ALEC activities. Even the fast food places we depend upon are part of the overall PIC operation - McDonalds and Wendy's. Reservations we make for American Airlines and the likes of AVIS rent-a-car are taken by inmates. More and more call centers are coming on line every day manned by inmates in both state and federal prison operations. Each position taken by an inmate, used to belong to private sector workers who are now unemployed. Another industry I've briefly touched upon needs to be discussed here. That is the agriculture industry. One side effect of immigration laws being enacted in the Western states is the reduction of migrant workers in those states that have passed tougher immigration policies. Not one to miss such an opportunity, prison industries are vying to fill the voids created by these laws. Colorado has been one of those states hardest hit because of new laws similar to that of SB 1070. In an effort of providing labor to the farmers in that state, the legislature has partnered with the state DOC to implement a new program allowing for the use of inmates on private farms. "To meet the needs of the capitalist farmers, the state legislature has partnered with the Colorado Department of Corrections to launch a pilot program this month that will contract with more than a dozen large farms to provide prisoners who will work in the fields. More than 100 prisoners will go to farms near Pueblo, Colo., to start the program in the coming weeks. Prisoners will earn a miserable 60 cents a day. The prisoners will be watched by prison guards, who will be paid handsomely by the farmers. The practice is a modern form of slavery. The corporate farm owners and capitalist politicians are defending the program. They claim that business needs to be "protected" for the sake of capitalist production in the agricultural sector." "As states increasingly crack down on hiring undocumented workers, western farmers are looking at inmates to harvest their fields. Colorado started sending female inmates to harvest onions, corn, and melons this summer. Iowa is considering a similar program. In Arizona, inmates have been working for private agriculture businesses for almost 20 years. But with legislation signed this summer that would fine employers for knowingly hiring undocumented workers, more farmers are turning to the Arizona Department of Corrections (ADC) for help." It isn't surprising that agricultural and farming needs would be pointed in this direction by state legislators...where ALEC's efforts of eliminating "illegal" aliens from agribusiness work coincided with their SB 1070 and earlier state legislative efforts. They realized the impact the laws would have upon immigrant workers and that a labor force would be necessary to take the place of immigrants picked up or scared off by laws like SB 1070. CCA, Geo and state prison industry operators were informed of the expected future labor needs of U.S. farmers and began to gear up in 2007 when ALEC successfully proposed and was able to enact one of the first restrictive immigration laws in Colorado. I believe ALEC projected the impact on farming, predicted the labor need and advised prison industries to be prepared to put inmates out in agriculture work on short notice. As soon as the Colorado law went into effect, prison industries had inmates picked, vetted and with the proper custody level ready to step into the shoes of the missing migrant workers. All in all a very effective business plan put into place by ALEC and their members - eliminate an entire industry workforce and replace it with a workforce supplied by their members at a wage scale of less than $1.00 per hour. At the same time salaries of the prison staff guarding the workers is paid for by the farmers. Talk about a win-win-win business plan. Prison labor had been used in Arizona for more than two decades prior to SB 1070. However the enactment of that law made the need for inmate labor to treble - along with profits from that labor. Other occupations are being impacted by privatization of prison related healthcare. Many doctors are now choosing to work in prison rather than private practice. Obviously this switch lowers the number of doctors available in the private sector. One reason for this change in direction by physicians is retirement benefits and free malpractice insurance offered by prison healthcare corporations, such as PHS. If more information is needed to clarify the financial impact of continuing incarceration upon us as a society take a brief look at Washington State's latest efforts to address the state deficit. The below cuts are necessary to reduce the budget by $600 million. A substantial need for such reductions was created because of the state's continued reliance upon incarcerating more and more citizens, reducing private sector jobs through the use of prison labor by large WA. corporations such as Boeing and Microsoft. "Among the cuts approved by legislators: nearly $50 million from the Department of Corrections, including the closure of a prison facility; $50 million from K-12 education, including funding intended to keep class sizes small; $51 million from higher education, including at several of the state's flagship universities; nearly $30 million from a state-subsidized health insurance program for the poor; and the elimination of non-emergency dental care for poor adults." What a trade off, huh? More cuts to education and social programs that benefit the poor while they pay out millions to prison industries and private prison operators - and give tax breaks to Boeing and Microsoft. Washington citizens are getting the shaft - especially their students and the poorest among them. While Washington state is making terrible cuts to the budget, elsewhere prison workers and their supporters are successfully keeping unnecessary prisons open to keep prison staffers from losing their employment. An action that keeps taxpayers funding their salaries - needlessly. "ETOWAH COUNTY, Alabama -- U.S. Immigration and Customs Enforcement officials have agreed Thursday to delay removal of more than 300 inmates from Etowah County's detention center until at least the spring, the Gadsden Times reports. ICE officials had notified the county Saturday that they would be removing the inmates from the Etowah County jail, which is the only facility in Alabama with a contract to house ICE inmates. On Thursday, after intercession by the county's congressional delegation, ICE agreed to keep inmates at the facility and use Etowah County's prisoner transportation services until March 31, 2011, according to the Gadsden Times, which cites a news release from Sheriff Todd Entrekin. The decision stops what would have been a substantial economic loss for the jail and could have resulted in the loss of some 49 jobs." While this fight to keep jobs and inmates in AL. is fought, another fight results in the loss of a successful privately operated reentry program for ex-offenders in Virginia. The state has decided to "re-vamp" its reentry efforts and closed this and 12 other successful programs. Even in instances where volunteers and organizers step-up to address recidivism, the state steps-in and thwarts their efforts. It's almost like there are efforts going on at the state levels to keep incarceration and recidivism rates up. Our country is being turned into a nation of prisoners and those who pay for their incarceration costs - period. Everything else is being cut to keep the PIC in place and profitable. Medicare and Social Security are next in line in the next U.S. Congress. Don't you find it odd that of all the rhetoric about our failing economy, the cuts to social and community programs, unemployment and unemployment compensation arguments - none of our lawmakers are openly voicing calls for any reduction in imprisonment? I mean there have been hundreds of articles identifying incarceration costs as being responsible for necessary cuts in funding for education and other necessary programs...but no one wants to go on the record as supporting a stop to mass incarcerations? How is it that our elected officials continue to cut more and more out of annual budgets to pay for incarceration and make no effort of reducing the need for that incarceration? I believe it is because they're paid handsomely to avoid any effort of reforming laws or reducing incarceration. It is simply too profitable to allow us to stop sending men, women and our children to jail and prisons. “Legislators wonder why the budget for the Department of Corrections is so large,” said one state employee who is familiar with the department. “As long as they keep trying to criminalize everything they find personally offensive in the name of law and order for the benefit of the folks back home, the budget is going to keep growing. ”Each legislative session, dozens of bills are introduced by Louisiana lawmakers to either create new criminal statutes or to increase penalties for existing laws. Only rarely does a bill attempt to reduce penalties for crimes. In the 2010 regular session alone, for example, 68 of 93 bills addressing criminal procedure and crime, called for jail time for new crimes or longer sentences for existing laws. Those included crimes ranging from “unlawfully wearing clothing which exposes undergarments or certain body parts” to cyberbullying, and terrorist acts. "Local sheriffs relish the opportunity to house state prison inmates because it infuses needed cash into the local coffers. One state official said the actual cost to sheriffs to house the state prisoners is only a fraction of the $24.39 daily income per prisoner. “It’s a big bonus for the sheriffs,” he said." Right now prisoners in Georgia are striking due to being used as slave labor by that state's prison industries. Such strikes are unheard of and one reason is the huge amount of "get-back" available to the prison staff and their willingness to use physical means to force compliance. My heart goes out to these men, as I've been there and know how dire their circumstances must be to cause such a dangerous mission from behind bars. Many are trying to provide assistance to them through phone and email communications with prison authorities, but so far the prisons involved (6) remain on indefinite lockdowns with reports of retaliation at each facility being reported via cell phone calls from the inmates. 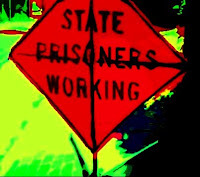 There has been limited media coverage of this historical strike (and no mainstream media attention) - again, it is not in their best interests to publicize this action to the public, for fear of creating a discussion on the merits of using inmate labor in a "slavery like" manner - though from reports, thousands of inmates are participating in the strike. These men represent those who are now performing the work previously performed by Georgia private sector workers, and doing it for pennies on the dollar. As shown by the above information, every facet of our lives are now touched in some way by prison privatization, prison healthcare, feeding of prisoners or by working prisoners in the PIC. This puts their products in our homes, on our grocer shelves, in our produce consumption and reduces available private sector jobs - including positions for physicians. Sadly we must realize that all of this is financed with our tax dollars that are quickly converted to "profits" once received into the coffers of corporations participating in the PIC. Many comments have been made to my Insourcing Series saying we should identify those involved and boycott their products and services. As this segment demonstrates, it is nearly impossible to identify each corporation, group, organization or individuals involved in PIC and prison industries. Their products are so vast and diverse, each of our homes now have one or more of those products in use. Even picking up the phone and calling for technical assistance with products, making a reservation or inquiring about services may put us in touch with an inmate on the other end of the phone. The Prison Industrial Complex is simply too vast to avoid or boycott - in a manner typically used by consumers and concerned citizens. Boycotting is usually an activity used to refuse our business to those involved in practices we object to. In this case it is just too difficult to accurately identify prison industry participants. I'm working on developing a program now that may allow all of us to identify those companies, businesses and corporations not involved in any way with prison labor or the PIC. We can eliminate the profits realized by corporations using inmate labor, by reducing sales of their products. Just as those participating in the PIC transfer our tax dollars into profits, we can transfer their anticipated future profits back to the private sector worker through participation in this program. The only thing these corporations understand is "profit". Money drives them and is what gets their attention. So let's get their attention by denying them sales - not boycotting. I intend to set up a website allowing those not connected with the PIC, not investing in or funding prison industries and not selling any products made by inmates or inmate provided services to be named. The site is intended to list corporations, retailers, providers and businesses certified as not involved in PIC operations. Links to these certified non-participating company websites and online catalogs, local outlets and products lines will be made available. In addition those industries, corporations, investors, banks, finance companies and others identified as profiting from PIC or prison industries in any form will be identified and "blacklisted". In this way one comprehensive site can be used to identify those products, services and companies to avoid while providing links to U.S. retailers and companies not involved, that provide the same products or services without the use of prisoners. In order to participate, these companies must "Certify" in writing that they use no inmate labor, do not invest in or sell products made in prison. Secondly they will be required to use the "Made in U.S.A." labels with products and services provided by American workers and offer those products to U.S. consumers. Prison made goods include those made in China and elsewhere that are finding their way to our retail shelves more and more of late. There are strict prohibitions against allowing imported products into the U.S. when those products were made by prison, slave or child labor. These strict provisions are being circumvented in some instances and deliberately ignored by our Custom Service in others. Companies, businesses, retailers and manufacturers wishing to be listed within the proposed site, must certify non-use of those foreign prison-made goods as well. The site is intended to allow consumers to identify those not involved in prison labor related products and offer shoppers a discount direct from participating U.S. manufacturers, retailers and service providers for purchasing their products or services made by U.S. workers in our private sector markets. This will help increase jobs and deny continued profits to those using inmate labor. This effort will be time consuming and expensive to develop and put into operation. Sponsors and volunteers will be needed to assist in this endeavor. This is going to need the expertise of a website developer, software programmers, advertising and accounting assistance. We are going to need people to submit to us the names of businesses they own, work for or invest in that are not associated or affiliated with prison labor or products. Money is going to be needed to advertise the site and make consumers aware that such a site exists to provide them with alternatives to prison made products. If successful this will put money into the pockets of those manufacturers and retailers who refuse to become involved in prison made goods for profit. It will provide those businesses with income to hire more workers due to increased production and sales. Originally posted to Bob Sloan on Tue Dec 14, 2010 at 03:23 PM PST.